Toward the end of Jesus’s Sermon on the Mount, he says, “So in everything, do to others what you would have them do to you, for this sums up the Law and the Prophets” (Matt 7:12). After all of the moral/ethical teaching Jesus has put forth about what we do and how we treat others, Jesus tells us that it all comes down to whether or not we treat others as we wish to be treated. Of course! And why not? Who wants to be spoken of as a fool? Who wants to be lusted after as an object rather than be regarded as a person? Who wants to be deceived and lied to? Who wants to be hated? Who wants to be unfairly judged by double standards? Not me! And probably not anyone of us! For that reason, we should treat others as we ourselves want to be treated. Now I just want to remind Christians that this also applies to the way we treat our Muslim neighbors, including how we speak of them and speak to them. In the wake of the latest act of terrorism in the Boston Marathon Bombings, perpetrated by a pair of self-professed Islamic Jihadist, questions about the beliefs of Islam are once again under the microscope. That’s unfortunate because like us who are Christians, Muslims do not want the actions of one individual or small group to become the definition for what all Christians and Muslims believe. That we speak kindly and generously about Muslims rather than passing on half truths couched within condescending remarks and demeaning images, since we want them to do with regards to us. That we assume the best about every individual Muslim, especially those we do not know personally just as we want hope they will do with us. That we avoid making claims about what the Qur’an does and does not teach based on hearsay and decontextualized proof-texting since we would rather Muslims not do with the Bible. That we stop making judgments about Islam and all Muslims based on the evil actions of some professed Muslims since we don’t like to be judged and have Christianity judged based on the evil actions of some professed Christians (i.e., the Westboro Baptist Church). That whenever possible, we talk with our Muslim neighbors rather than just talk about them. And remember that regardless of what any Muslim says or does, as Christians, we are to do what Jesus says and does! May God bless us to be the ministers of reconciliation we have been called to be in Jesus Christ! 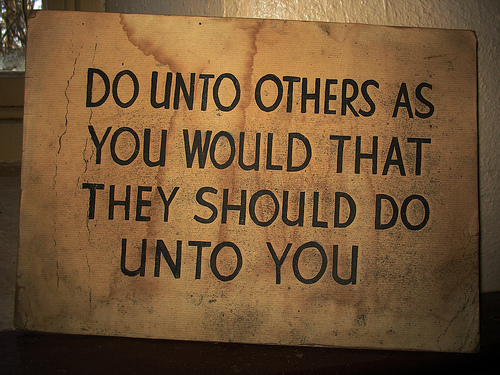 I’m curious: Does the Qur’an have a similar mandate with respect to how to treat others? I’m not aware of a specific passage from the Qur’an that I could cite but of the Muslims that I have personally spoken with, they believe that the teaching of the Qur’an calls for them to be peaceful people. They also regard the extremism/terrorism as wrong and not a true expression of Islam, much like most Christians regard the actions of groups like the KKK in relation to Christianity. Outstanding, Rex. Thank you for bringing us back to where we need to be. Thanks and thanks for being a shepherd of God’s people.